Since the hotel is a corner building, some room has stunning views. One queen and two twin beds. 60-65 meters. 12 meters from apartment balcony. Has wonderful views over the city. Sitting area with sofa, table and chairs. All rooms have LCD Tv cable, complimentary wireless Internet access, Air conditioning, tea and coffee making facilities, children’s rooms, 2 single beds, open kitchen, kitchen equipment, washing machine cooker and refrigerator. Bathroom with shower, toiletries, 4-person dining table, Towels, slippers, and hair dryers. 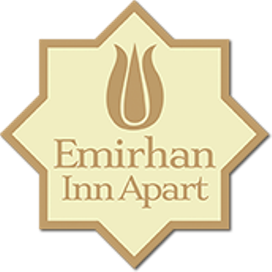 Emirhan Apartment welcomes you with the comfort in your own home. Our flats have their own kitchen so you can cook and entertain your guests and with its a peacefull location you can enjoy your self and relax.